As I wrote about in my Cranberry Apple Rice post Thanksgiving right around the corner and many people entertaining this time of year or just enjoying dinners together as a family at night I decided to play with more side options. 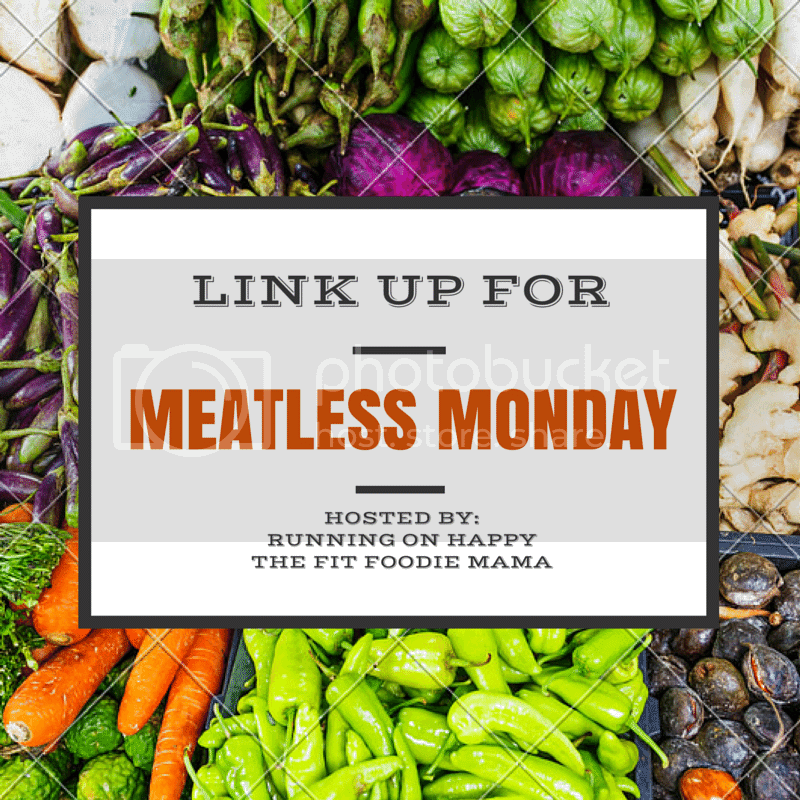 With so many different dietary restrictions out there I wanted to come up with a few dishes that would be great to serve that everyone can enjoy. Whole food side dishes that are full of flavor and healthier alternative to some traditional side dishes while still using the same flavors. One day I played with a couple having a few flavor profiles and ideas in my mind and making a couple options trying to decide which components I like best with each. This salad is actually one I would enjoy as a main dish all by itself! Instead of a side I would add a side to it, like maybe a glass of wine. 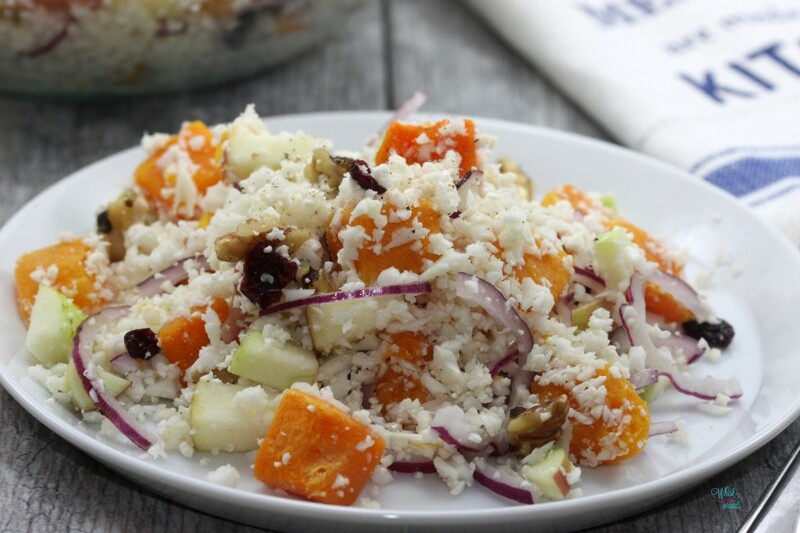 A mix of riced cauliflower, roasted butternut squash, fresh apples, dried cranberries, onion, and walnuts or pecans. The only thing that I may swap or change out in the future is for those not a fan of onions making it with leeks. Since 3 out of 4 of us are fans of onions I kept the red onions in this one. 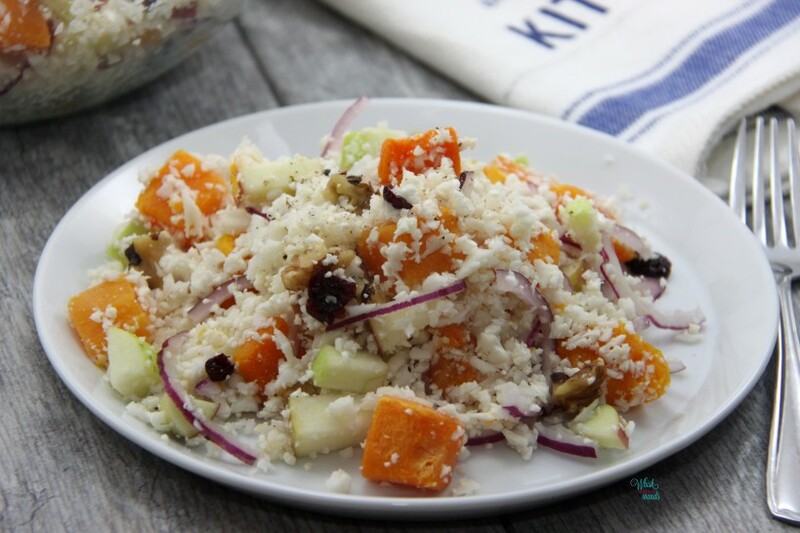 Whole food goodness this salad is full of flavor and color and you can’t go wrong! Gluten free and vegan this is an option that all can enjoy. Even kids love it! A even took it for lunch the day after since I made a huge batch of it! Lately she has been hit or miss on even her favorite foods and pickier than usual so I was shocked when she asked to take it to school for lunch. 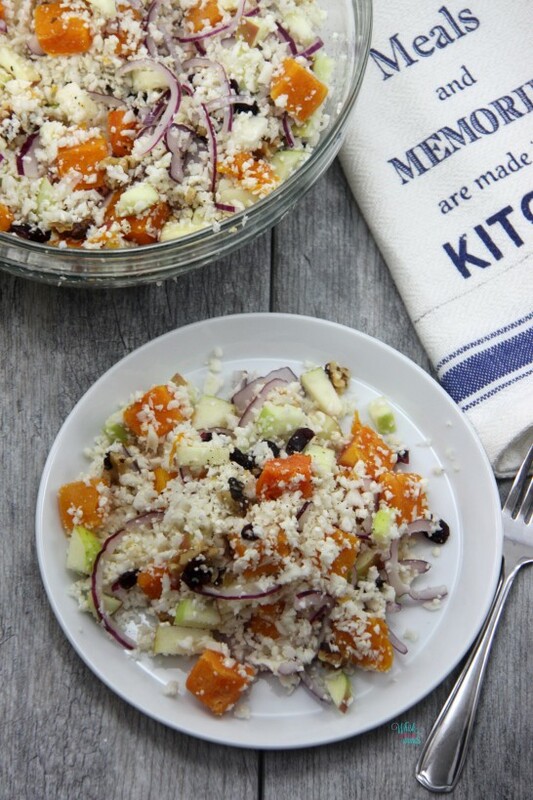 This is a cold salad with warm or cooled roasted butternut squash so it can be made ahead and taken to your next family gathering. Preheat oven to 400F. Spray baking sheet with coconut oil or non stick spray and spread squash out evenly. Roast squash for 20-25 minutes until tender. Rice cauliflower by pulsing in a food processor. Place riced cauliflower in a large bowl. Core and chop apples and toss with lemon juice, discard extra lemon juice. 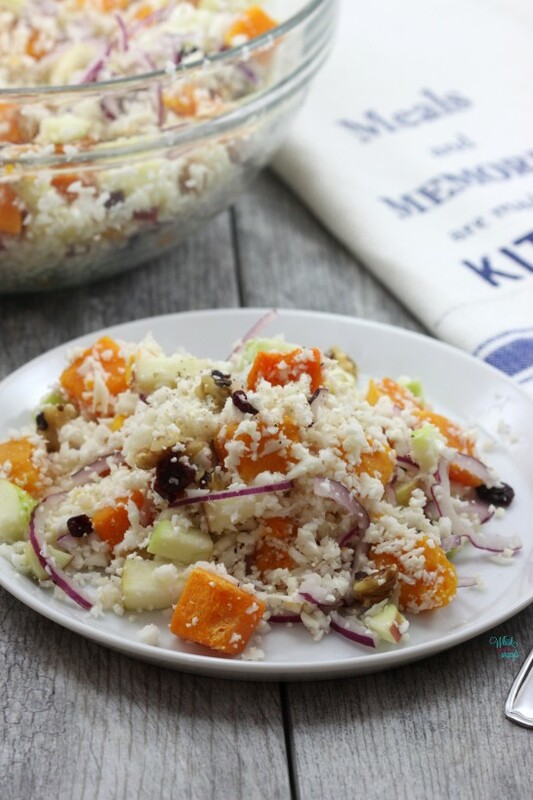 Add roasted butternut squash, warm or cooled, to the rice cauliflower along with apples, cranberries, red onion, and chopped nuts. Toss to mix and season with sea salt and pepper to taste. Enjoy! 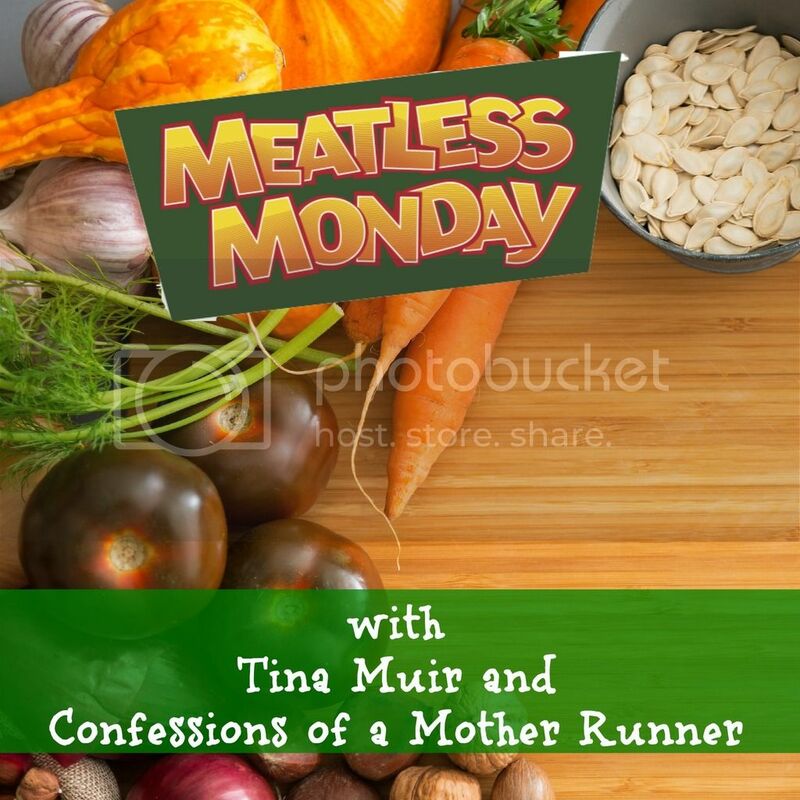 It’s Monday, looking for more Meatless Monday recipes and inspiration? Check out more delicious creations from fellow bloggers! Can you believe I’ve still never made cauliflower rice? This looks delish, need to try it! Mmmm cauli-rice! For Christmas last year I made a killer cauli-rice recipe and my family loved it! Total win! I was shocked at how much this was loved by others as well! Is your recipe posted? Should I think of hunger games as soon as I see this? I do! It sounds delicious though! You know the way to my heart! Umm I don’t think so… why Hunger Games? Thank you! Ummm we should definitely sit around eating this and drinking wine. How simple, and crazy flavorful! I’m trying to be a bit more exciting this year at Thanksgiving (since it’s our first gluten free thanksgiving, I feel like I need to be creative). 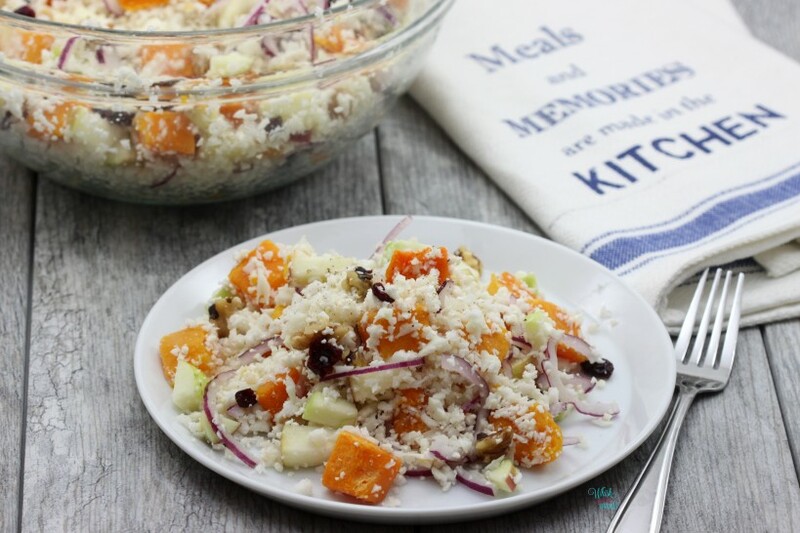 I love cauliflower rice, this might just be a winner for this year! Thanks for sharing! YES we should! If you try it let me know what you think! This is beautiful!!! Love the colors and textures.